There is something fun about making a gingerbread house at Christmas time. 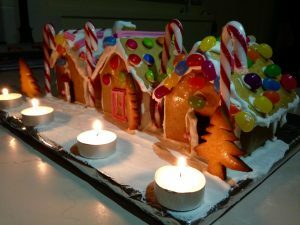 Creativity in the kitchen brings people together and the result is a gorgeous gingerbread cottage covered in lollies. It will add Christmas cheer to your lounge room until the time comes to eat it. This recipe includes dimensions for a standard sized gingerbread house or a few smaller sized houses. Smaller sized houses are easier to assemble, require less lollies to decorate and are great if you want to make a few at a time. Combine butter, brown sugar and honey and melt in the microwave or on the stovetop until the sugar dissolves. Leave to cool for ten minutes before adding the zest, eggs, and sifted bicarb soda, spices and flour. Stir to form a dough before turning onto floured surface. Knead adding extra flour as needed until the dough loses its stickiness. [Tip] To save the bench I put down a section of baking paper to knead the dough on. Cover and refrigerate for and hour. While the dough is refrigerating, cut paper patterns for the gingerbread house. 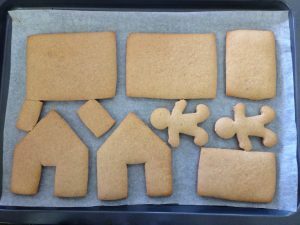 To make smaller houses for a gingerbread village, cut two rectangles- 10.5cm x 7.5cm for the roof, two rectangles 7.5cm x 5 cm for side walls and two rectangles 8cm (wide) x 9.5cm (high) then trim the last two rectangles to make the house shape- angled point on top with sides 5cm high. See image for more details. Dimensions for standard gingerbread are at the bottom of this post. Pre heat oven to moderately hot (190oC). Remove dough from fridge and roll out so that the dough is .5cm thick (1cm thick if you are making the standard size house). Cut shapes from the dough using the pattern, re-rolling the off cuts as needed. Cut additional shapes with cookie cutters or freestyle with the leftover dough eg. trees, gingerbread men, a chimney. Place shapes on trays lined with baking paper and bake for 10 mins or until firm. Remove gingerbread shapes from oven and make the glaze by mixing the water, caster sugar and gelatine together then melting either in the microwave or on the stovetop. Brush glaze over gingerbread pieces while they are still warm then leave them to set. At this stage, you can cut doors or windows if desired. Make royal icing by beating the egg white until frothy then gradually adding in the icing sugar until the icing is a thick, sticky paste. Stir in lemon juice. Keep icing covered to prevent from drying out. Use a piece of cardboard or a tray covered in tin foil as a base then use the royal icing to ‘glue’ the gingerbread house together. Be generous with the royal icing, the extra icing doubles as ‘snow’ so there is no need to be neat. When the gingerbread house is sturdy, it’s time to get creative and begin decorating. Finish by coating the ground with a layer of ‘snow’ (left over royal icing) and a dusting of icing sugar. You can see in the image to the right I cut out little doors. I ended up trimming them to neaten them after baking so decided it would have been better to cut the shapes out after baking. The larger rectangles are the roof shapes (10.5cm x 7.5cm). The smaller rectangles are the side walls (7.5cm x 5 cm) and the house looking shapes with the doors cut out are the rectangles 8am x 9.5cm cut to an angled point from 5cm high on the side to the centre of the top. If royal icing begins to set, soften by adding a few of drops of water or lemon juice. Add tea light candles for a cute little evening display. To make a large house, cut two rectangles- 21cm x 15cm for the roof, two rectangles 15cm x 10 cm for side walls and two rectangles 16cm x 19cm (then trim to make the angled point so that sides are 10cm high).